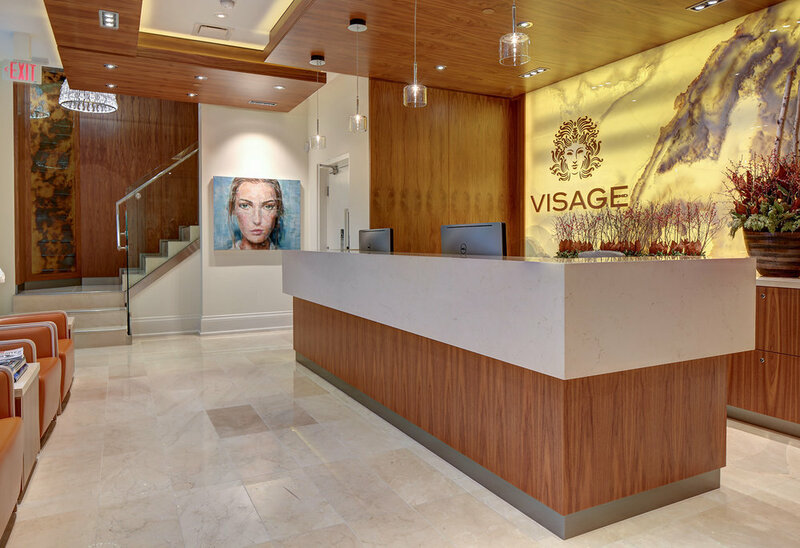 The Visage Cosmetic Plastic Surgery Clinic, located in the prestigious neighbourhood of Yorkville in downtown Toronto, is a 4,500 SF clinic and surgical suite with medical spa and cosmetic surgery. The design solutions provided a seamless integration of movement, functionality and artistry. The clinic is situated on the ground and second floor of a luxury condominium. The internal circulation, as a result, was planned to offer a very discreet yet elegant entrance. The façade and structural system were designed together with the architects and engineers of the luxury condominium. The project team visited the surgeon’s existing clinic to study his practice and aesthetic values. From the observations, the team conducted interviews and mini workshops with the doctor, office manager, anesthesiologist and registered nurses to study further about their practice needs and styles with a focus on internal movement. The next step of the design process included an overlay program relationship diagram in a realistic scale with the findings from the workshop to test run the clinic’s flow under different scenarios. The result was a set of principal design guidelines and layout that became the backbone of the design of the Visage Cosmetic Plastic Surgery Clinic. The privacy of patients, and the flow of receiving, visiting, treating and releasing patients, were the most important design criteria of the project. The design divided the clinic into two zones with separate entrances and waiting areas for different types of patients. Programs on the more accessible ground floor is more public, whereas programs on the second floor are more intimate. 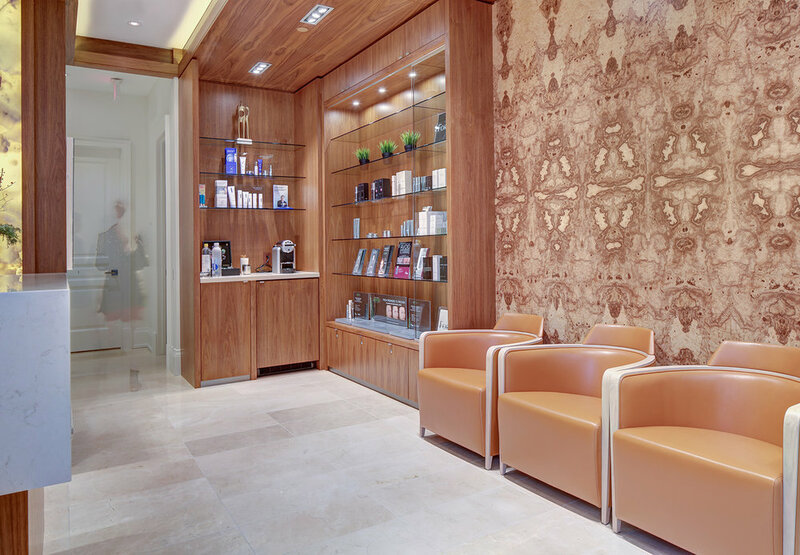 The ground floor welcomes its patients with a space for spa and regular skincare. This floor also houses the doctor’s office and photo room to preview surgical results. The second floor carries a more intimate waiting area for patients about to have surgeries. The operation room, recovery room, overnight patient rooms and nurse station is also located on this floor. 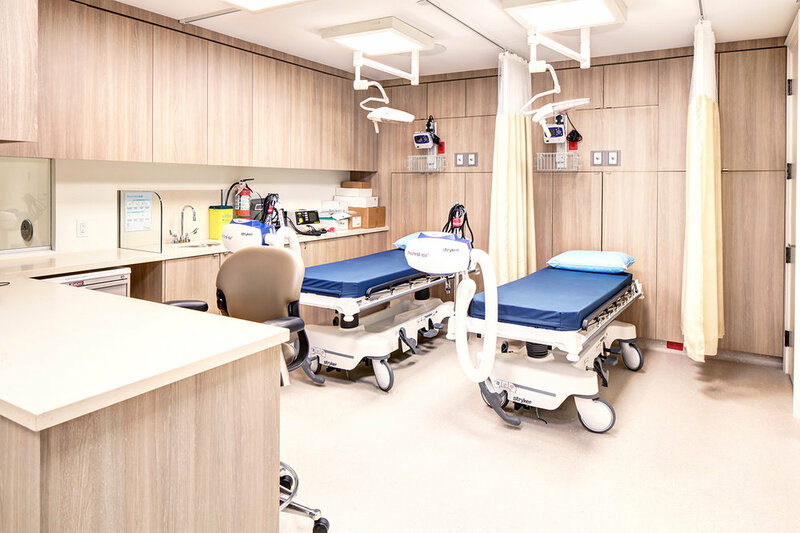 The clinic, moreover, required complex building systems design in such a way that pressure and ventilation are provided in the surgical room and recovery room, while fresh air is pumped throughout the clinic to maintain a steady level of comfort. The selected material palette evokes comfort. The more public ground floor was designed with mostly natural stones and exotic wood with book matching pattern and warm tones to express the surgeon’s idea of pursuing perfection. This same design motif is carried through to the common areas of the second floor. Once in the more intimate program areas, the design motif transitions into a non-porous, durable and easy to clean materials with a matching colour tone.